GeneTex is proud to launch its new VetSignal™ line of products to advance veterinary science research. 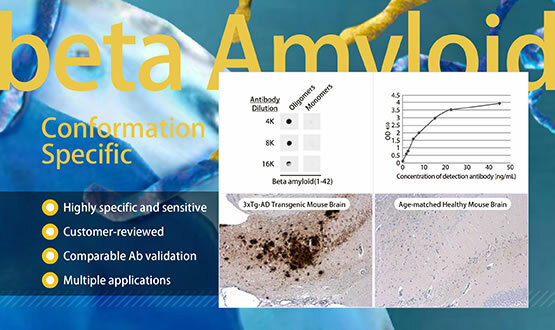 GeneTex’s “beta-Amyloid (1-42) antibody – Conformation-Specific” can specifically detect amyloid plaques in the Alzheimer's Disease brain by IHC-P analysis. The superior specificity and sensitivity of this antibody were confirmed by dot blot, ELISA and side-by-side IHC-P comparison with competitor's. 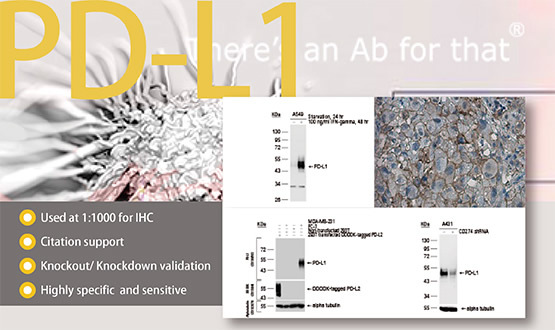 GeneTex proudly offers an outstanding PD-L1 antibodies. The quality of this antibody was demonstrated through stringent validation including knockdown, drug treatment, and cross-reactivity test, by using WB, IHC, and ICC. We strive to serve and accelerate life science research by creating essential biomedical reagents where quality can be found in every vial.